I’m pretty pumped up about tomorrow. It almost feels like Christmas. Tomorrow morning, I will be uploading the fourth episode of The Underground Wellness TV Show to the YouTube channel. My guest is Board Certified Clinical Nutritionist and traditional naturopath David Getoff. This particular episode is ALL about water. David and I cover chlorine, fluoride, and all of the other harmful toxins that may be lingering in your water supply and toxifying your body. And, of course, we also cover (at length, in fact) exactly how you can safely remove these toxins from your water. In the video below I share with you a couple of my favorite safe water products. First, I cover my trusty shower filter. 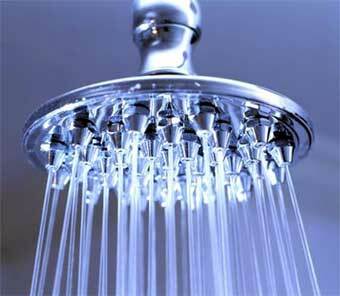 Did you know that taking a 15-minute shower in chlorinated water is like drinking eight cups of it? Craziness! Then, I get into my fabulous glass water bottle — because I like my water to be estrogen-free. I guess we can call tomorrow David Getoff Day. Stop by here in the morning for our TV show. It’s a really mind blower. By the way, Brett Klika is my second guest. He puts me through another one of his extremely creative workouts. Then tune in to tomorrow night’s UW Radio show. It’s Ask David Getoff! You can call in and ask David anything you want about your health and wellness. The man is a genius! The radio show goes down LIVE at 5pm PST/8pm EST. Click HERE to listen by internet. Or dial 347.237.5608 to ask David a question on the air. If you’re a bit shy about calling in, post your question on the UW Facebook Page. Click HERE to order my e-book The Dark Side of Fat Loss! Ten chapters of Truth Bombs! How to Remove Fluoride from Your Water! This entry was posted on Wednesday, December 14th, 2011 at 2:47 pm and is filed under wellness. You can follow any responses to this entry through the RSS 2.0 feed. Hey Sean – Thanks for taking us inside your house and showing us what you use on a daily basis. What was the brand of the shower filter you use? Also do you use a water filter for daily drinking water? Thanks for the Truth Bombs! I use a New Wave shower filter. I don’t have a filter for my drinking water. I buy the RO water from Whole Foods. You’re dead on with the information about chlorine. Chlorine is ingested along with the mist while showering and also absorbed through the skin. If you want to truly be disgusted by chlorine, go to the EPA site and read up on chlorine dioxide, which is the chemical compoung for chlorine. If people knew what they were being exposed to every day, they would be horrified.